On Saturday we took another little snowbashing trip up to Seven Mile. There wasn’t much snow at the bottom, but as we climbed in elevation the amount of snow grew. When we reached the meadow there was a couple feet of wind blown crusty snow. Both Jason and I tried it in two wheel drive without any luck. Jeff’s KJ doesn’t have the best snow tires to start with, so he wasn’t doing much even in four wheel drive. While we were at the meadow Jason noticed his front end making noise. It had been making a clicking sound on our last trip up Johnny Park road, which was only a prelude to it’s complete disintegration at Seven Mile. His front diff was shot, it sounded like the teeth on the ring gear were gone. Fortunately he had a set of chains, or so we thought. Recently Jason had traded the 35″ Goodyear MTRs on his blazer for a set of 37″ Goodyear MTRs. It was a great deal, but now his chains were too small (actually they were 33″ chains, so may not have worked well on the 35s either). It took us a few minutes, but we with some straps and bungees we were finally able to get the Blazer all chained up. Amazingly enough the ELocker and the chains worked really well, and we were back to doing some wheeling. We stopped for lunch, and decided that I should lead the pack since my tires were good in the snow, and I had four wheel drive. We set off up road 171 to go around the loop. Usually Jason and the Blazer leads, so breaking trail in the snow added some difficulty. The snow kept getting deeper, and the Scout being all locked up does not like to go straight down the trail. 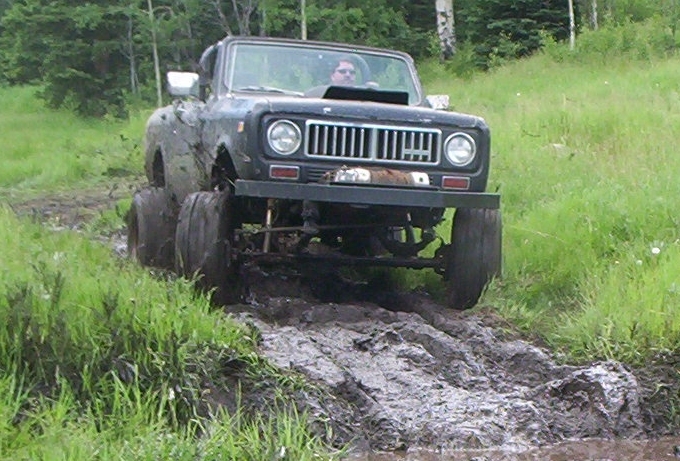 Several times I was steering completely into the skid and the truck kept moving sideways down the trail. At one point I encountered a fairly large drift, the snow was well over my 35s. I had to make several attempts before I made it through, and during one of those attempts started noticing a pretty significant vibration in the drive train. Jason and Jeff were behind, and didn’t see my amazing blast through the drift, but I had them check on the noise. We figured it was probably a u-joint, and at that point had no choice but to press on. I didn’t have chains, so there were few other options. We continued on, and at some point I missed the turn off for road 171 and the trail out (by this time we were all getting ready to take our broken rigs home). After another go round, which was easier since we had already made tracks, we got on the right road, but again this was new snow. The trail itself wasn’t bad, but the clearings where different trails met were really deep and hard to get through. Jason got off the trail and stuck at one point, and they had to winch him out. On top of it all, we had an all out blizzard going on. I was starting to get nervous, both about the deep snow and about the unconventional noises coming from the front of the truck. We had a discussion, and decided to press on. I would lead, and hopefully Jason wouldn’t have too much trouble with just the chains. Fortunately that was at our last rough spot. The trail got a little better, I went a little faster and we started to make it out, until the Scout died. Last year when we were on Moody Hill I had a wiring problem with the Scout. I was just going down the road and the wiring under the dash caught fire. The wire that burnt up supplied power to the coil, so I was able to just run a new wire from the battery to the coil and bypass the whole thing. I’m planning on rewiring the whole truck, but it hasn’t worked out yet. I had also added a toggle switch to this wire so I could conveniently start and stop the truck. The additional power wire bypassed the ignition switch. As we were headed down the trail, my toggle switch decided to quit working and the truck quit. It took a few minutes, to determine the problem, but once we bypassed the switch we were up and going again. A few minutes later we were back to the main road, the sun was shining and everything was good in the world again. After we stopped, we took a closer look at the Scout. It looks like my CV joint on the front driveshaft is shot. The angle on the front driveshaft is really bad, and we knew it was just a matter of time before either the CV or the u-joint blew up. Next Next post: End of the line for my LeSabre? ?